Are you a fedora lover? What kind of hats do you prefer in spring/summer, if you wear it? Ciao Lilli, i cappelli mi piacciono e in genere mi stanno bene, purtroppo non riesco a portarli a lungo. Hi Lilli, ypur hats selection here are fabulous. I love wearing hat during summer. These are perfect for the Beach. Happy Friday! I wish I suited a fedora more but I have a very round face and they just don't seem to work on me! Anything that brings cool air to the head while protecting the hair is a good thing. I love your selections, Lilli! Happy weekend babe! Oh si, assolutamente... sono un fedora lover!!!!!!!!!!!!!! As you probably know, I love hats Lilli, and have quite a collection. I really like these styles that you selected. Fedoras are one of my favourites. Have a lovely weekend. I love fedora's and want to invest in more. I'll take the black one! Sono molt belli, adoro portare i cappelli! Molto belli questi di Fedora! I think I need to buy a new hat as the weather is very hot! I'm huge fan of straw hats as well Lilli. It started as a fashion accessory for me but I'm definitely interested in the sun protection now too. Fedoras are my favorite for the same reasons as you. They're just so effortless and go with everything. I can't wait to pull my straw ones out. I'm still wearing my cotton ones. Have a wonderful weekend my dear! adoro i cappelli, belle queste proposte! Such beautiful hats! !I have a white straw hat i think i have to buy a black one too! Oh,it's so hot here these days!Have a happy weekend my dear!Enjoy! These are all so gorgeous! Many kisses! Have a great weekend!!! Un accessorio che decisamente non può mancare per l'estate!! Bellissimo quello bicolor! Buon week-end Lilli! Bellissimi Lilly, come vorrei mi stessero bene!! ( io non trovo un cappello che mi stia ok)..
Bellissima selezione! Un bacio tesoro. Hmmm... Mango, Zara, H&M?! So hard to choose just one, but I prefere the brights! I love seeing others wearing fedora hats! It's such a lovely way to dress up an outfit, it's always very chic. Again, I have yet to buy one for myself but hopefully I'll find one that looks good on me soon. Great post.=) I love hats. These hats are my absolute favorites! I prefer them over wide brimmed and floppy hats. I'd love to have a fedora since I currently don't own one. The white ones are gorgeous! Have a lovely weekend. Nice selection!!! I love fedora hat!!! You know I have a hat shop, I love Panama hat, handmade from Ecuador It is very cool and stylish. Hi sweet Lilli! 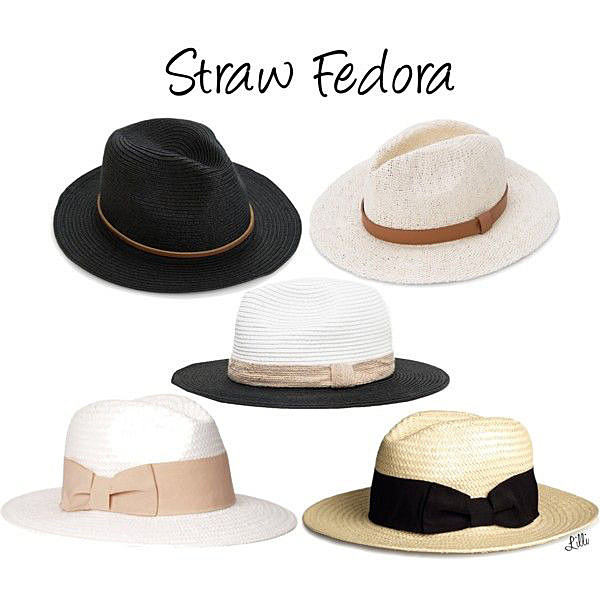 I love straw hats, especially in the Spring and the Summer. I fight the temptation to wear them in the Winter because that wouldn't be appropriate. I love the sun, but because of the medication I have to take, I must avoid the sun so that is another reason why I love to wear hat. One summer a few years ago, I wore my fav fedora hat but suddenly there was summer rain and my hat was ruined. I was so sad because it way my fav hat. Anyhow, I really like your selection. You have impeccable taste, dear Lilli. Io li adoro!! Questi poi sono davvero bellissimi!! ciao Lilli! anche io ho un debole per i cappelli! quello nero e marrone lo avevo notato anche io, ma mi piacciono moltisismo anche quelli più chiari (che trovo più estivi) e quelli in paglia! sono un accessorio assolutamente must have! I have a fedora hat that I love it to bits but the only time I wear them is during my travels to beach areas or summer areas and during photoshoots. Somehow I can't really wear headgear like caps/hats etc for too long as the heat would all be inside that gives me a headache rather than protecting me. A straw fedora doesn't keep the heat in too much and so I love it. It is nice to see you layering as the weather gets warmer. I read that as "I'm NOT a fan of..." hahahaha! I had to do a double take and immediately noted my mistake. I love your hat collection and the way you style them. I love them too, but I'm really picky with mine. I prefer them sitting in my wardrobe than on my head. They just annoy me sometimes. Ciao Lilli. Io adoro i cappelli ma non riesco proprio a indossarli perché non mi stanno benissimo. Mi piacerebbe acquistare un Fedora prima o poi.